This island is based on the Timmy Failure illustrated book series by Stephan Pastis, and is the first time that it appears in color. The island begins in medias res, with an intriguing and disastrous scene involving a garbage truck. Then, we go back to the beginning of the story. Go left and talk to Timmy — currently hiding in a bush because he has lost his pants. It's up to you to find out who stole them! Follow Timmy all the way left, past the park, and go all the way to the left of the street to find Timmy's house, whose unfortunate family name is Failure. But don't go in just yet. Continue left, to the mansion grounds (owned by Timmy's great-aunt Colander). 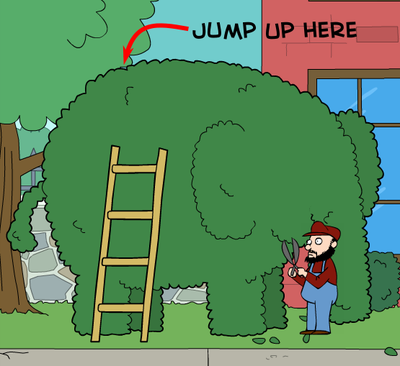 At the far left, you'll see the gardener trimming an elephant-shaped bush. Climb the ladder leaning on it and jump on top of the elephant. 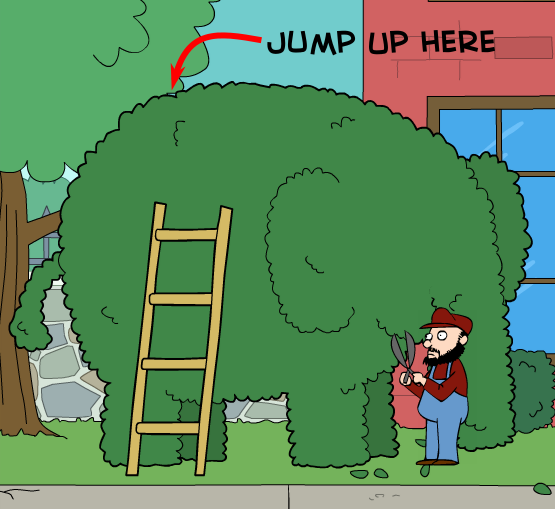 Suddenly, the trunk will snap off! Drop down and collect the gardening shears that Bingo dropped (wow, gardening shears sure are becoming a recurring motif in Poptropica). Then go back right to Timmy's street and enter his house. 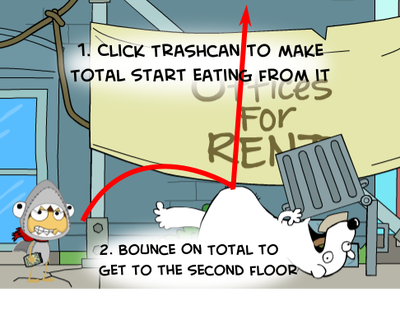 Go left, to the kitchen, to find Timmy's perpetually peckish pet polar bear named Total (yes, the Arctic kind) groveling for a snack. Well, let's give him one! 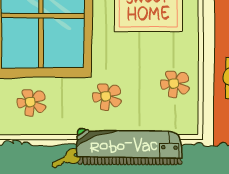 There's a Robo-Vac (like a Roomba) prowling back and forth on the floor of the house. 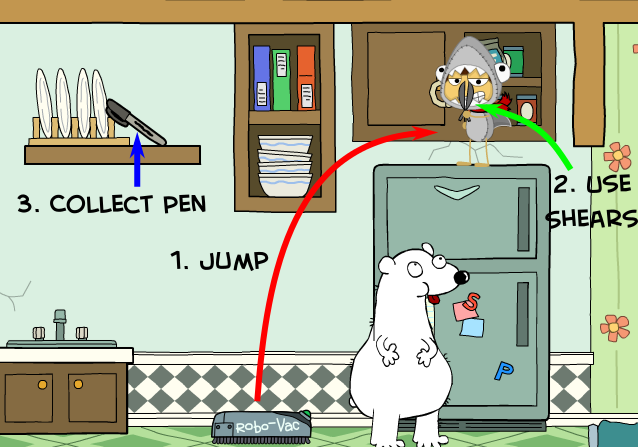 Jump on top of it, and then jump from there on top of the fridge. There, use your gardening shears to break the lock and collect the Crispy Rice Treats. As long as you're holding these, Total will follow you anywhere. And whenever you press SPACEBAR while holding them, Total will come to you. We've got ourselves an ally! Before you go, go left in the kitchen and jump up to the dish rack to collect the permanent marker. Try to exit the house through the door. 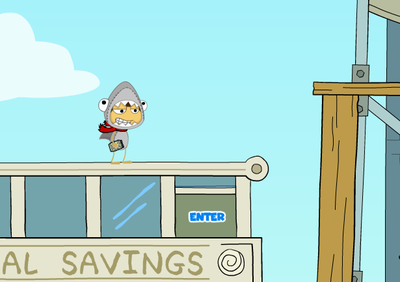 Timmy will interrupt you, and drop onto you a fetch quest to find a cardboard box, a surveillance camera, and a pen. Well, we have one of those things. But first, go all the way to the right of the house and climb the stairs up to the top floor. Go all the way left to the window, where you'll find Garbanzo Man, the most fearsome inanimate house guardian of all time! Click on him. Uh-oh... he fell out the window! 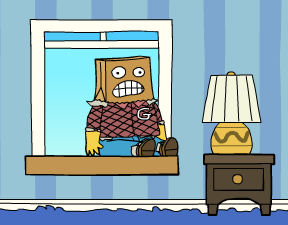 Leave the house through the window and drop down, then collect Garbanzo Man's menacing paper-bag mask. Now go right to the park. Go right and jump up on top of the swingset and collect the pole. Continue all the way right, to Main Street. You'll notice a delivery boy outside the First National Savings bank, looking for a certain Corrina Corrina (Timmy's rival) to deliver his package to. And the package happens to be... a surveillance camera! Keep going right until you see the trash can in front of the building under construction. Click on it. Suddenly, Total will pick it up and start chugging on the contents! Disturbing, yes, but it's the perfect time to jump on Total's exposed belly. This will bounce you up very high, to the first level of the building's scaffolding. 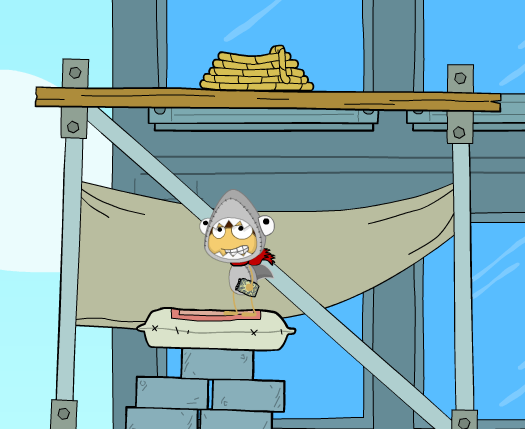 Go left, climb the stack of bricks, then jump up to the second level of scaffolding. 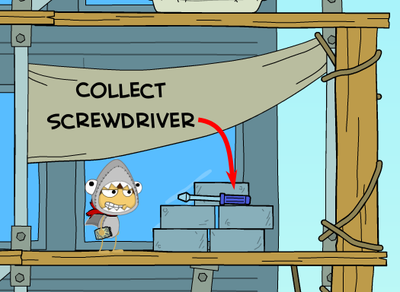 Go all the way right and collect the screwdriver from the pile of bricks, then climb the pile of pricks and jump up to the third level. Go all the way left and drop down to the roof of the bank. Click on the open window. You'll drop into the building, while still technically staying on Main Street. Walk all the way left. You'll drop down to the top floor of the bank. Go to the middle of the bank, so you're just behind the door. Now don the feared and loathsome Garbanzo Man mask. Then, click to blast the door open and lunge out. Scarred for life, the delivery boy will instantly recoil in bloodcurdling terror at the sight of your sinister, bone-chilling visage, and drop the prized surveillance camera. Pick it up and remove the mask, your evil machinations of terrifying little kids now complete. Cackling cruelly, go all the way right, to the Zoo. Go as far right as you can, collecting the red bucket from the ground as you go. Go right until you can see the other polar bear, Stacy, bouncing her ball up and down. Equip the pole that you collected from the park. Now you can reach the red button inside that controls the left side fan. What we want to do to obtain that ball, is to get it oscillating by repeatedly switching the fan. First, when the ball is as high as it gets, turn the fan on. Then when it's is as far away from you as it will get, turn the fan off. Then when it's as close to you as it will get, turn the fan back on. Repeat this until the ball bounces out of the pool and out to you. Why did we bother getting the ball at all, you may be asking. Go all the way left, to the mansion grounds. 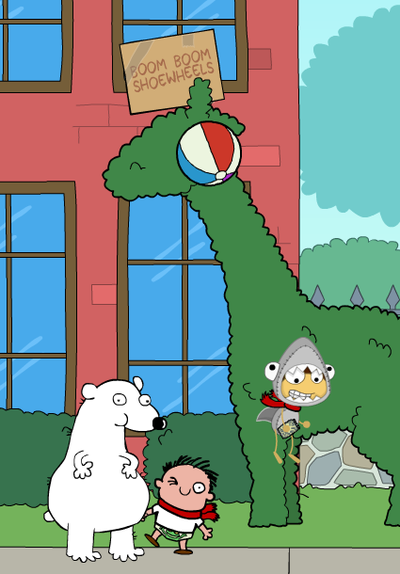 Timmy will be there already, eyeing the cardboard box on top of the giraffe statue. Use the beach ball to get it down. You'll throw it at Timmy's head — not exactly what he was intending — and then it'll bounce up to the box and knock it down. Collect it. A pop quiz? Oh no! Do you know what subject? English. Why, what's with the time limit? It's only ten minutes long. What else could there possibly be? This test will go on your permanent record! Suddenly, his wobbling head will shake the slide, blasting Total straight out. Go right and pick up the notebook leaf about Molly Moskins. Apparently she is in need of some shoes. Just as you finish reading, Molly herself will show up from the left. Talk to her. 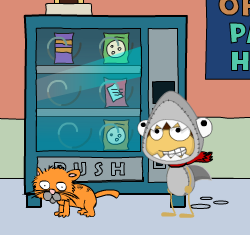 She wants her cat, Señor Burrito, rescued from the vending machine, but it takes coins only. And she won't fork over her cash unless she has some collateral — in the form of shoes. Go left, and into Timmy's house. The Robo-Vac seems to have stopped working... I wonder why? 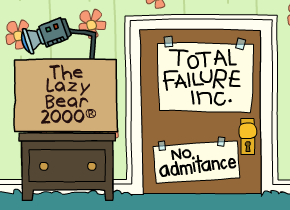 Click on the LazyBear 2000 and you'll discover that it had swallowed a key and gotten stuck. Now go to the vacuum and use the screwdriver. 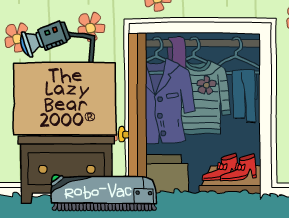 You'll remove the key, and the Robo-Vac will continue on its merry way. Go all the way right and use the key to enter Timmy's headquarters... which turns out to be a rather generic closet. Collect the red shoes, then return to the park and offer them to Molly. She'll buy them for three dollars. 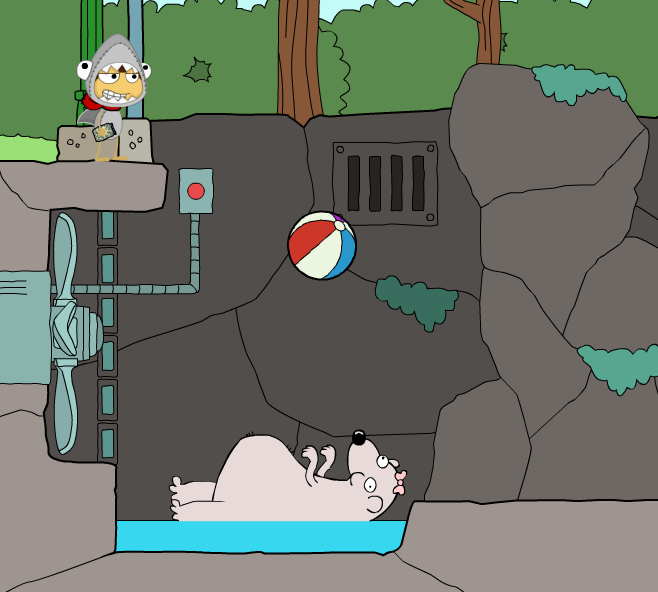 Now go all the way right, to the Zoo. Go to the chicken nugget vendor and buy some with the money you got. You'll get the nuggets and some loose change. Go back left to Main Street, then enter the bowling alley. Use the change to purchase some bonbons. You'll get the cat out, hooray! 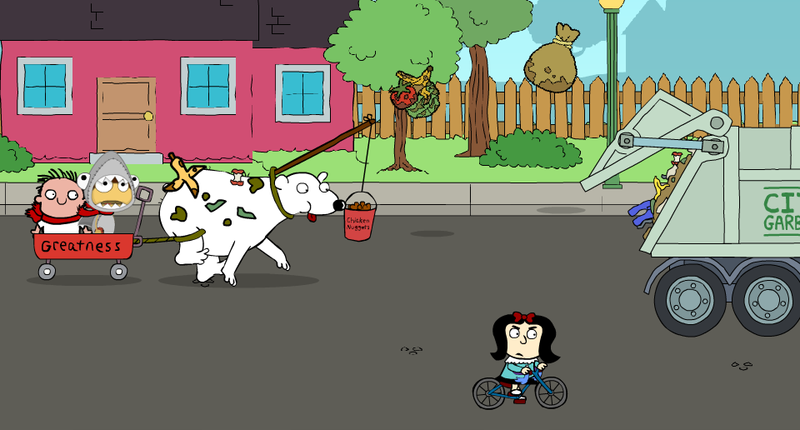 Go back to the park and return the cat to its owner, Molly. 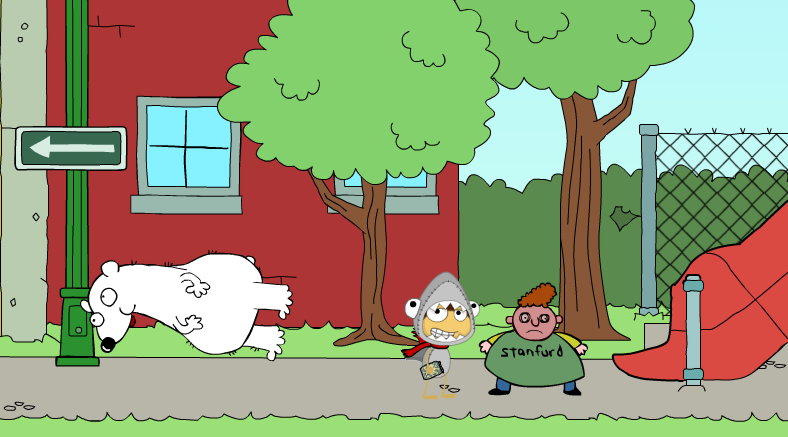 Just then, a garbage truck passes by — with Timmy's pants! We've got to notify Timmy, who is currently atop the tall building on Main Street. Go back there, to the garbage can in front of the building. Again, click on it to get Total horizontal, chugging from the can, and you can bounce on his belly up to the scaffolding. Climb the scaffolding as you did before, but this time go all the way up to the top. Go to the ladder on the right side, and climb up. This part is also quite straightforward. Go left, and jump up. Collect the rope. Go right, across the windowsills, and jump on top of the pies (which somehow support all your weight). Jump up to the higher windowsill, go left, then jump across the gap to the leftmost windowsill. Climb the vine, go right, jump across the gap. Jump up, then climb the other vine, to get to the top of the tower. 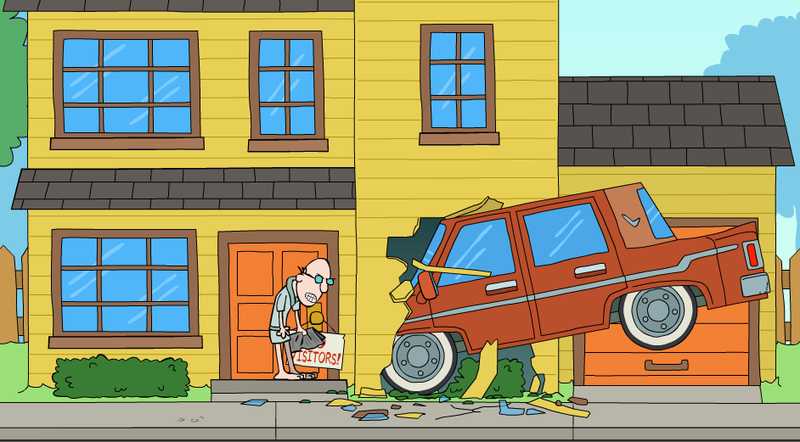 Talk to Timmy; he'll suggest that you use Crispin Flavis's car to chase the truck. Drop off the building, and go into the Bowling Alley. 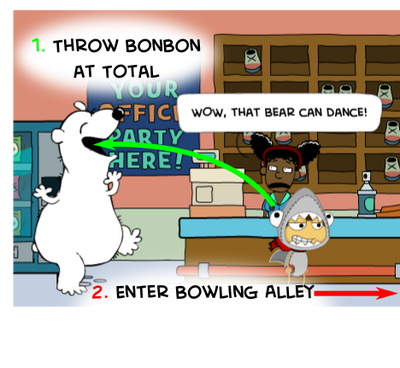 The woman at the desk won't allow you into the bowling alley alone. Well, it's time to distract her. 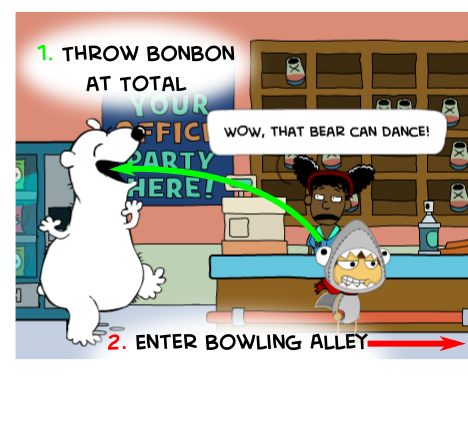 Equip the bonbons, then throw one at Total. He'll eat it, and then promptly start dancing. While she's still looking at him, you can sneak in to the right and talk to Crispin. He'll challenge you to a game of bowling. The minigame that follows is extremely easy. You have 4 tries to make 30 points (a strike gives you 10 points). 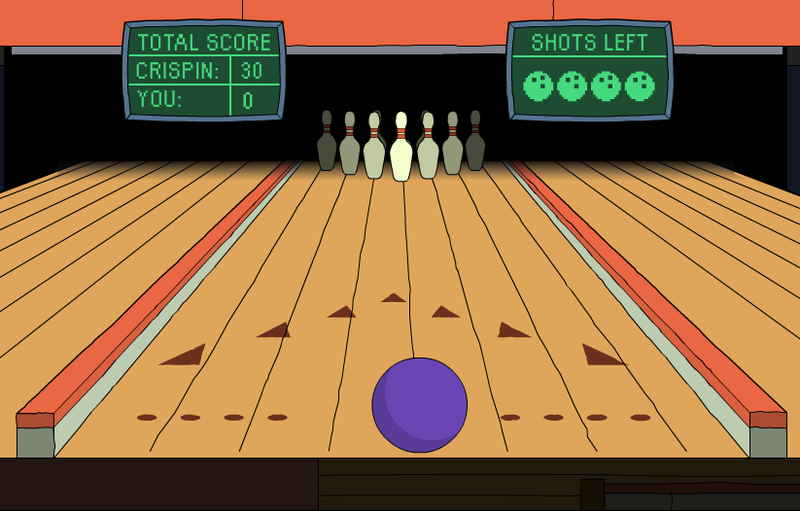 The ball will oscillate left and right at increasing speeds, and you have to click when it is in the center. You know, the traditional way. Once you've beat him, he'll give you his car keys. Go outside the bowling alley and use the keys to get into the car parked there, and drive away. (Driving without a license is not funny in real life!) Either way, you end up crashing into the house of Timmy's teacher. (Which is the main reason you shouldn't drive without a license anyway). Now, the only way to catch up to the garbage truck is to build... the TOTALMOBILE. All we need now to build it is a wagon. Go all the way left, to the Mansion Grounds. Stand next to the wagon, and throw a bonbon at Total. He'll start to dance again after eating it, distracting Bingo. 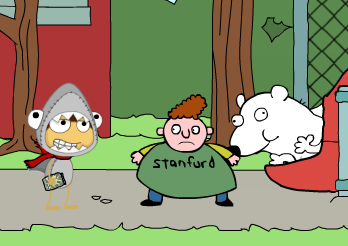 Click on his wagon to grab it, then run right back to Timmy next to his teacher's house. He'll assemble the Totalmobile and you'll be off after the garbage truck, which is also pursued by Timmy's arch-nemesis, Corrina Corrina. 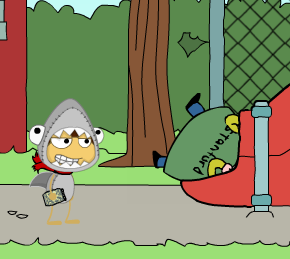 Here follows another classic Poptropica minigame; you click and hold to move Total vertically across the road, avoiding the bags of trash that fly out of the garbage truck. Just wait until a piece of trash flies out, then move somewhere else. After a while, the truck will stop and you'll crash into it! Suddenly, the opening scene has become much clearer. Right, now let's cut straight through the trite ending lines and get what we're really after — the Island Medallion! And 150 credits to spend in the store too. 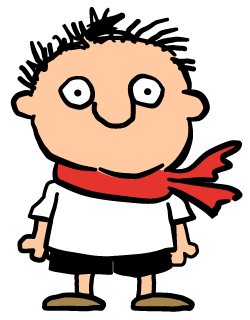 Another Timmy Failure adventure unraveled in a characteristically genius manner. 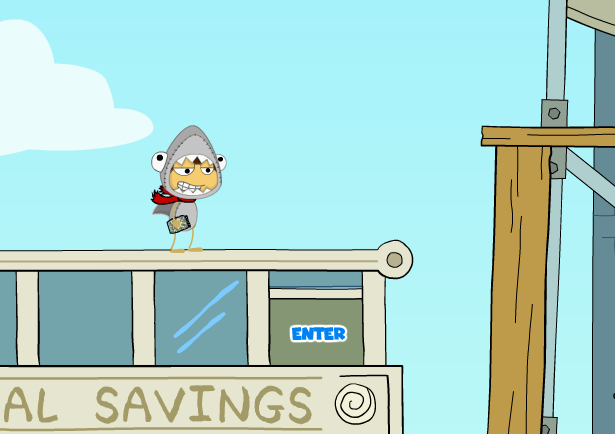 Fail on, Poptropicans!